Keven Lacombe (Spidertech p/b C10) was enjoying a career-best season in his third with the Canadian squad before a nasty injury cut it short in June. But the resilient 26-year-old will be back with the team next year, and has plans to begin the season in Europe. Lacombe was coming off of an eighteenth place in the Canadian road race championships when, in the criterium finals, he went down hard on a corner. The result was a triple fracture of his jaw and the loss of several teeth. Prior to 2011, Lacombe could boast wins in the Tours of Cuba and Pennsylvania. 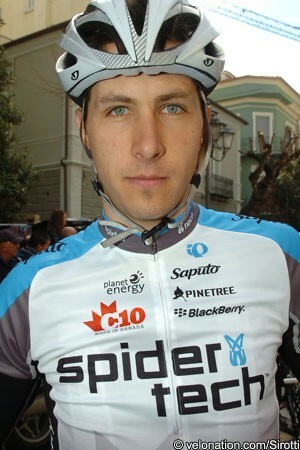 After spending his first two professional seasons with Kelly Benefit Strategies-Medifast, Lacombe joined what is now the current Spidertech p/b C10 squad. Lacombe saw some success in his biggest taste of European racing in 2011, picking up top five finishes in stages of the Circuit de la Sarthe and Ronde van Drenthe, as well as the Tour of Calfornia in the spring. As he was saddling up for the summer, the broken jaw derailed everything and had Lacombe questioning his career decision. As Spidertech-C10 continues to pick up bigger races with its current Pro Continental license, Lacombe has decided on a unique way to prepare for European races in 2012. “Starting in January, I’ll be in Europe,” he added. “Just before the WorldTour races in Quebec, I bought myself a motor home. I’m going to send it over to Europe on a boat.” The Spidertech-C10 European program begins in February, and Lacombe plans on being ready.